In the early 70s there was still some innocents left in bodybuilding. We were a subculture within a society of couch potatoes that only a handful of men would dare participate. We went about our daily muscle-building lifestyles as if we alone knew the secrets to radiant health and Herculean physiques because that’s how we felt when we trained in the gym. We owned the world and were aiming for the stars. There was no stopping our momentum as we were driven to succeed. We trained as if there was no tomorrow and dreamed of impossible goals that would one day be realized. We may have lost some of that naïveté since then. However, whenever we reminisce about those old days of Guts and Glory, our hearts instantly warm. Looking back at it all, bodybuilding has been good to me. Not only has it provided me with superior health and vitality, it has also given me the confidence and fortitude to take on every challenge that has crossed my path. Bodybuilding has enabled me to go where most dare not venture. It has given me the drive to test my limits without fear and has shown me how to reach levels of performance I never dreamed possible. The sport has also taught me the power of positive thinking and has given me the ability to zone in on the task at hand. Most of all, bodybuilding has provided me with the keys to success, and for this I am grateful. I am a natural-for-life bodybuilder. Always was, always will be! Throughout the years, there have been many individuals who have motivated and inspired me to excel in my chosen sport. Many were natural bodybuilders while others were not. Some were world champions, others local muscle builders. Whatever their philosophy or title, I am better because of them and will always be grateful for the inspiration they gave me along my life’s journey. Throughout my many years in the sport, I have collected and read just about every muscle magazine ever published. From my early training days as a teenager, when I first visited Dan Lurie’s Barbell Company in Brooklyn and bought every current and past issue of Muscle Training Illustrated, to the late 1990s, when I could no longer tolerate the enormity of anabolic androids and images of T&A that graced the covers and filled the pages of just about every modern physique publication. Bodybuilding magazines were very inspiring back in the 1960s to the 1980s. Men who had bodybuilding in their hearts published those magazines. When the muscle-builders of the day read the stories about the eras top bodybuilding champions, they absorbed every written word into their own training and lifestyles. We all followed the workouts of the champs, ate as they did, and took the same supplements that they endorsed. The magazines of yesteryear were also very informative and provided sensible training and nutritional concepts, while the publications of today seem to rely chiefly on anabolic androids and big-breasted gals on the covers to make sales. You name the magazine and I had it. I had every Muscle Builder & Power, Iron Man, Strength & Health, Muscle Mag, Muscular Development, Health & Strength, Mr. America, Muscle Training Illustrated, Muscle Digest, Flex, and so on. I had several decades’ worth piled ceiling-high in my basement as their numbers reached into the thousands. Not only did I possess so many issues, but I made it a point to read and memorize every fact and theory printed in them. If it was not for the physique publications of the 1960-80s, I doubt I would have gotten very far in bodybuilding. The inspirational images of the champs during the sports golden era helped to fuel my drive each and every day. Whenever a new magazine would hit the newsstands, I was first on line to get a copy. I was hungry to succeed and got my fill through reading the bodybuilding magazines of the day. So many Herculean covers have motivated me to succeed. So many dreams were created and realized thanks to the physique publications. Early in the 21st century, I gave away thousands of the muscle magazines to friends who shared the same passion as I did. Today, I have a few hundred of my favorite issues left in my archives to remember what muscle building was really like during the Iron Age of bodybuilding. Sorry e-Bay, they are not for sale! During my era, I purchased many training booklets published by the champs of the day. I had and still own all of Pearl’s, Schwarzenegger’s, Columbu’s, Zane’s, Park’s, Sipe’s, and Scott’s complete training sets of booklets, along with many more from the other champs of yesterday. When it came to bodybuilding, I was well-read. If you asked me about a particular champion, competition, or what training principles were best, I knew the answers. I absorbed the physique publications word for word and came to my own conclusions of what worked best for my students and me. I remember my home’s basement gym. 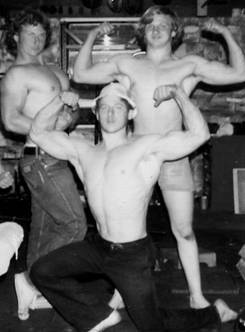 My brothers, Johnny, Domenic, and I (see photo – 1976) first started to body build with my father’s original barbell set. Gradually, as we became stronger and more developed we purchased additional weights and equipment to fill our needs. Eventually, the basement in which we made great gains during our youth became obsolete and was replaced by our home’s spacious garage. Soon, neighbors and friends joined us in our quest for muscle and then the inevitable followed with the opening of my Staten Island Bodybuilding Club. I have made many great friends because of bodybuilding. I remember all the good times as well as the bad. I remember all the loves that came my way and the few that were lost because of it. Yes, bodybuilding has been a big part of my life. It is a lifestyle that I will continue until my last dying breath. Today, my main focus in bodybuilding is to inform others of the potential dangers of drugs within the sport and to set an example for others to follow. Bodybuilding is a never-ending battle. For me, it is a war worth waging and whose victory is worth savoring. It’s a lifelong journey towards fitness and longevity. It is like a painting that is never finished, as there is always something more to be added to the masterpiece. In some ways bodybuilding is a living form of art that changes with every repetition, every set, and every workout that is performed. As the days, months, years, and decades tick by, I will continue to improve upon my creation. Today, everything in bodybuilding has been amplified to the max. There are many more muscle builders, spectators, self-proclaimed experts, training philosophies, methodologies, and exploitation of the bodybuilders. Manufacturers of exercise equipment and nutritional supplements promise muscles fast in exchange for a few hard-earned bucks. The sport where once common sense principles governed the iron lifters has seen a radical shift by today’s muscle pumpers who demand instant results by any means. Long gone are the small storefront gyms of the 1960-70s. Bodybuilding today has evolved into a billion dollar industry. In days past, a few hundred steady members was enough to keep a gym afloat. Today’s multipurpose fitness centers enjoy memberships into the thousands, which brings large sums of cash into this ever-growing industry. 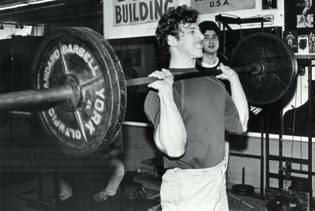 During the golden days of bodybuilding, gyms primarily consisted of a few basic exercise machines, benches, and several tons of steel. Today, smooth nylon belts that glide with ease have replaced the thick steel cables that once tugged on some exercise machine’s pulleys. The raw angle-iron benches of days past now come in an assortment of powder-coated colors with strong square tubing. Although the steel is still present in today’s modern clubs, it has been accompanied by rows of treadmills, elliptical trainers, recumbent bikes, aerobic classes, personal trainers, and corporate owners. The big named companies have replaced the personal touch, with most clubs looking similar in design. In the old days, individuals who lived for bodybuilding owned hard-core gyms. Their gyms had the magic! As soon as you would step into clubs such as Vince’s, Gold’s, or Pearl’s, you would feel the atmosphere. It was so thick that you could bounce a barbell off it. These gyms had members that were highly motivated because someone they believed in led them. Someone that not only knew how to build muscle, but also looked the part and lived the life. Those were the days! The gyms of yesteryear were not built to see how big a bankroll they could create but mainly for the purpose of building proportioned muscle and strength. In many ways, the sport has changed. In some aspects for the better and in some ways for the worse. The cold steel weight-plates and dumbbells are now rubber coated. The plates themselves have holes for better gripping. The huge posters of the bodybuilding champions that once hung in every gym have been replaced by artful drawings for those more fitness-oriented. The hard-core atmosphere that once energized the training floors of the Iron Age have been replaced with TVs and iPods. Sometimes change is good. For me, today’s multi-purpose fitness centers are a welcome change to the muscle-head gyms. After bombing and blitzing for over four decades it is nice to be able to bang out some heavy sets in an environment whose clientele is more than just muscle. Now don’t get me wrong, I am still hard-core within my heart and continue to train vigorously. It is just that I am self-motivated. Once I am finished training I exit the gym, leaving my hard-earned sweat behind. At this point in my life, it is all about my own self-satisfaction and health that keeps me coming back for more. Leave the rest for the gym-rats. Another thing that has changed to meet the demands and dollars of today’s fitness buffs is the evolution of the supplement industry. Volumes could be written on this, but to be brief, health foods and supplements have become a billion dollar industry in America. What began as a few bottles of supplements on the store shelves has grown into aisles of designer products. The marketing of these products in the bodybuilding and fitness publications help support some of today’s pro-bodybuilders and athletes through endorsements. Today, you can find designer supplements being marketed as having the same size and strength-building capabilities as anabolic steroids. It’s all fair and legal, I guess, and I wouldn’t have any problem with it except for one question. Why is there such a demand for these products? Supplements are just that – supplements. For our purposes, they were designed to enhance a properly balanced diet and not become the main source for one’s muscle building needs. Proper nutrition is not that complicated. You don’t have to be a rocket scientist to figure out how much protein, carbohydrates, fat, and calories you need. As Americans, our understanding of nutrition has never been better, yet supplements have become a mainstay in our land of plenty. Go figure!